we prepared to leave the house, 30 minutes later than planned, and to no fault of his. Why had I ever thought that being on a road trip in the middle of winter through the mountains was a good idea? 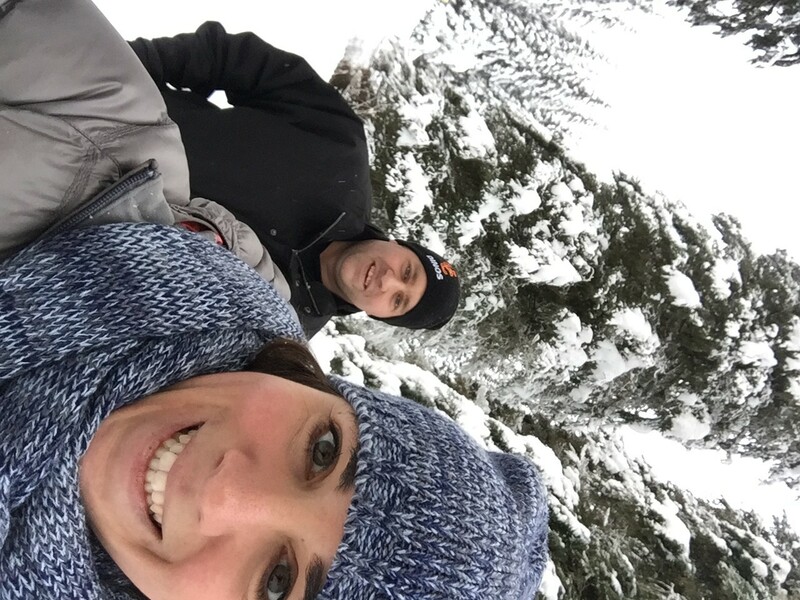 Especially considering my partner had never ever been on a pair of snowshoes, and well…. isn’t quite the outdoors mountain man. I had to to introduce him to snowshoeing though, if we were ever going to make it for the long haul. So it was off to the Kootenay Mountain Range, where a plethora of snowshoe opportunities awaited us. Driving into Fernie is like driving into the most perfect mountain town you have ever imagined. The Canadian Rockies surround the town on all sides, the downtown is full of historic buildings and the snow doesn’t seem to stop falling. There is a ton of snowshoe and Nordic trails in the wintertime, as well as hiking and mountain biking trails in the summer. It was the perfect place to break out my new snowshoes and put them to the test, especially considering how much snow had fallen. We headed up to Island Lake Lodge for our first snowshoe adventure, a high-end Cat Skiing operation that has opened its doors to daily visitors who are looking to dine in an incredible lodge and spend time exploring the grounds via snowshoe. A 20-minute Snow Cat ride takes you up to the top of the lodge where blankets of untouched white snow awaited us. Tossing the extra pair of snowshoes to my partner, I quickly buckled mine up not wanting to waste one minute. Ten minutes later, I am still waiting for him to figure out how to get them on, tapping my pole impatiently against the ground. Luckily for us, Mike McPhee, the director of marketing was on hand to take us around the property. Not just a marketing director, but also a photographer and outdoor enthusiasts, Mike wasted no time getting off the groomed trails and breaking his own trail for us. Just a quick reminder for all you readers, my partner has never snowshoed before and I am NOT the most patient person in the world. One step in and it was clear that the snowshoes he had on were not meant for deep snow (this may have been my fault). He immediately sunk in the snow up to his waist and couldn’t get out. Oblivious to this fact, I trekked on ahead, until I could no longer hear him behind me. Turning around I burst into laughter at his predicament and hollered “HURRY UP”, the only sound one could hear in this beautiful forest. For there wasn’t a bird to be heard, nor a whisper of anyone else. It was perhaps, the quietest place I have ever had the privilege of snowshoeing. The trees towered over us, dripping with heavy snow as the flakes slowly drifted down. This private land is an absolute dream for snowshoers, whether you choose to stick to the path or venture out into the unknown. Did I mention the five-star food we ate for lunch? A day later we motor into the town of Kimberely, famous for having an overly large cuckoo clock in the centre of town and a feeling you are in a small German town. It was only appropriate we ate at the Bauernhaus, a restaurant that was once in Germany and the owners deconstructed it and shipped it piece-by-piece to Kimberely. Stuffing ourselves with delicious German food was easy here and as we drifted off to sleep that night, I was glad to have a 3 hours’ snowshoe trek to look forward to in the morning. We had arranged to hook up with a local company, Ptarmigan Snowshoeing, for their 3 hour “Into the Wild” snowshoe and after hooking my partner up with some slightly bigger snowshoes, we joined Andrea for our trek. One of the most knowledgeable guides I have come across, Andrea, led us up a huge hill (or mountain according to my partner) for some outstanding views over Kimberely. It was here I learned about the history of this old mining town. As we trekked through the forests and down into the valley, Andrea pointed out trees that had been burned in fires but still stood tall, different animal footprints and all the types of eco-systems that exist. The trail was well walked by Andrea who comes out and breaks it after a large snowfall and by hikers and snowshoers in the community. Fortunately for my partner, he didn’t sink into his waist and it was at that moment snowshoeing became enjoyable for him. Watching someone go from disliking something you so greatly love, to enjoy it is one of the best things in the world. I could never imagine having to leave him at home every time I wanted to go out. As we finished our trek, coming back to the awesome Nordic Centre they have, it was easy to see the love Andrea has for the sport and the passion she feels for nature. I told her next time I was bringing the kids out for some snowshoe and nature education, it’s great way to get out with the family. A trip through the Kootenay region wouldn’t have been complete without a trip to Lussier Hot Springs, a hidden gem that allowed my partner to soak his sore muscles and a chance for us to appreciate how truly beautiful winter is. Located 18km down a logging road, these natural hot springs are surrounded with towering green trees dotted white with snow. As we crept down the ramp from the parking lot, it became clear that coming early in the morning was the right choice, as we were alone in this gorgeous pools. As I sunk into the hot water, surrounded by snow on all sides, it occurred to me that although I love snowshoeing, I absolutely love a good natural hot spring soak just as much.